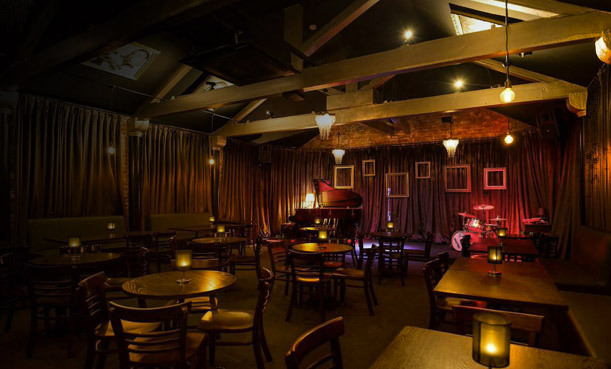 This unique venue has been at the forefront of Live Jazz in Melbourne for over 13 years now and has become a respected Live Jazz institution making it a vital part of Melbourne's Arts culture. It has featured numerous international and local acts over this time and has become a must see attraction for jazz music lovers. The three-story warehouse built in 1895 hosts two live jazz performance rooms and a Gallery tapas bar. The ultimate ambiance is reminiscent of the French post war Bee-Bop era and the club offers guests a beautiful setting and listening experience. The Iconic basement room has hosted some incredible gigs over the years. Voted by 'The Age' as one of five must see Melbourne venues. Don Burrows, The Aaron Goldburg Trio [NY], The Melbourne Symphony Orchestra, and in 2014 Robbie Williams and his bigband have all performed unforgettable shows. Bob Dylan was also seen enjoying the underground music room. This is a truly unique music room and well worth a visit. Set on our middle level this room is perfect for gatherings and small functions. We offer a full bar and tapas menu. Paintings of jazz greats cover the rustic bring walls and lush chocolate velvet interior. It is the perfect space for pre-show drinks and a catch up with friends. This room is situated on our top floor and is a new addition to the club. The exclusive room features state of the art sound equipment in a beautiful lush intimate setting. The wonderful acoustics create the perfect space for an evening of Jazz, Food & Wine. The Parisian Loft is truly of international standard and we are proud to offer it to Melbourne.